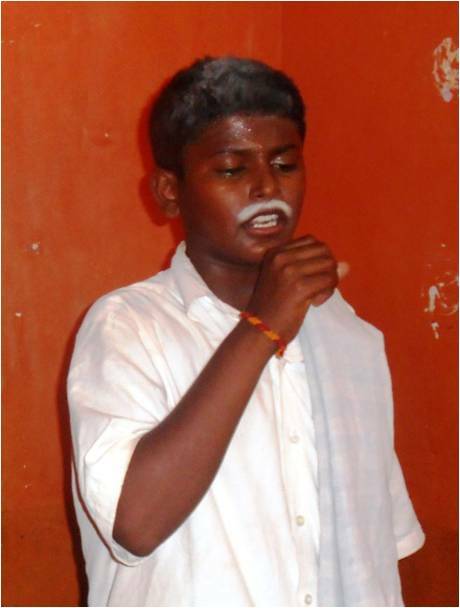 Dinesh attends Guruvarajpet High School and has been a student at our HoPE Learning Center for the past four years. Before joining the HoPE Center, Dinesh often forgot what he learned and therefore did not do well on exams. He would then become frustrated and pick quarrels with other students, even his friends. He was tense and sometimes behaved aggressively. Yet, after practicing yoga and Phonemic Intelligence exercises, he is now able to retain his school lessons and score good marks in all subjects. For exams he now likes to sit in groups with his friends and prepare for exams. His attitude and social skills also significantly improved, particularly when he was asked to find elderly beneficiaries in his village. Dinesh immediately volunteered to give away rationing kits to elderly via our HoPE For The Elderly program. Dinesh and his friends now help poor elderly people by getting them government civil supply products and arranginbg for them to receive pensions through the post office. Dinesh even stepped way up to arrange a cultural program for village people during Diwali, which including Silamban (a form of Indian martial arts). Your generous contributions to HoPE Learning Centers help children like Dinesh figure out ways to give back to their communities. Please donate once or on a contributing basis to our HoPE Learning Center, HoPE For The Eldely and Phonemic Intelligence programs.